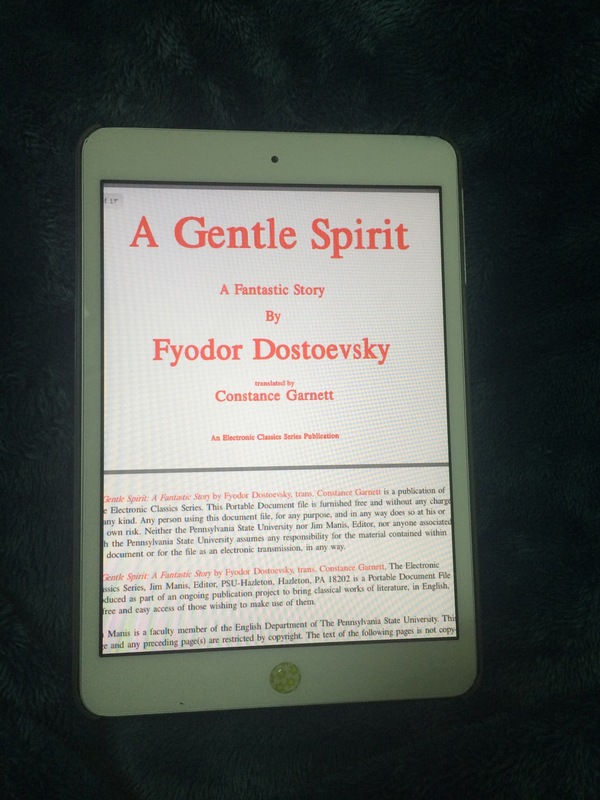 A Gentle Spirit is a short story by Dostoevsky. In this story, we meet a pawnbroker as he rambles about his marriage and life while watching the body of his dead wife laid out on the table in front of him, this “gentle spirit” he has recently driven to suicide. We listen to the story from the pawnbroker’s point of view who shifts between self-justification and self-flagellation. He is confused and lost. He doesn’t want to blame himself, but the fact of her death and his loneliness strikes him. He keeps asking questions and answering himself. He cannot accept the fact that she is no longer here…no longer here to love him ! It is difficult to lose, and more difficult when you cant understand why those you love most left you behind. All this confusion, hesitation and guilt result from his feeling that he lets her down, he doesn’t strive more to express his love. But again he explains that he loves her, and she just didn’t understand him. For him, the whole situation is incomprehensible ! The pawnbroker feels that he revenges himself from the society through his work. Still, he feels that it is his right to practice usury. He wants his young wife to understand this and to encourage him, but she didn’t. He wants to stress the fact that he is not a monster, and she among all should know this. However, he never tries to explain himself to her. He just expects her to “understand.” He feels that it is her job to hail all he does and to love him for that. He never tries to lead her “heart” gently into loving him. Rather, he expects her to do love him as forgetting that “love can’t be demanded”! This leads to the break in their knot, the knot that has never been tightened properly. Dostoevsky brilliantly gets inside the head of the pawnbroker and projects his feelings. The story teaches us of what silence and taking the other for granted could cost us. Relationships are sacred and the inability to understand each other could break this bond forever. All relationships go through difficulties, but only those that confess the presence of problems could survive. Usually the little words, and the ignorant gestures that could cause a breach in the holy bonds of lovers. The little things establish love and relationships and they could cause their collapse, too! This is not just a story of a young wife’s suicide and her husband’s confusion, but a message to all people…Open your eyes ! Communicate ! Don’t cause the death of others by your silence ! They say the sun gives life to the universe. The sun is rising and — look at it, is it not dead? Everything is dead and everywhere there are dead. Men are alone — around them is silence — that is the earth! “Men, love one another” — who said that? Whose commandment is that? The pendulum ticks cal- lously, heartlessly. Two o’clock at night. Her little shoes are standing by the little bed, as though waiting for her… . No, seriously, when they take her away tomorrow, what will become of me?